A financier had a wide reputation as a man difficult to separate from his money. A couple of promoters approached him one day and tried to sell him on a scheme they had. The financier talked with them for a while but said he could give them no definite answer as yet. Telling them that he would communicate with them in a few days, he showed them out of the office. One of the promoters seemed quite optimistic and voiced the opinion to his partner that he thought the financier was pretty well sold on their proposition. "I don't know," replied the other skeptically. "He seemed too suspicious to me. 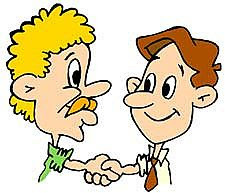 Didn't you notice that, after shaking hands with me, he started to count his fingers?" 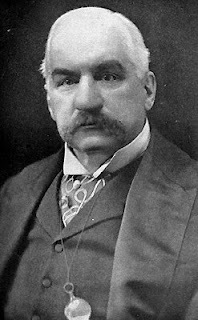 A legend of doubtful authenticity has it that J.P. Morgan was once present with a group of men at a bar in the financial district. Beckoning to the waiter, he ordered a beer; at the same time, saying, "When Morgan drinks, everybody drinks." Everybody had a beer and when Morgan had finished, he slapped a dime upon the table, saying, "When Morgan pays, everybody pays."